A special session of the Tel Aviv City Council met to address, for the first time, the problem of horse and donkey abuse in the city. The meeting came as a result of a proposal and recommendations submitted to the Council by Hakol Chai's attorneys in April 2005, followed by more than two years of continued pressure. The sight of emaciated, beaten, injured, and lame horses and donkeys pulling carts overloaded with heavy construction materials is common in Tel Aviv traffic. The animals are forced to work long hours without water or shade, under a blazing sun or heavy rain. When the horses can no longer stand, they are often abandoned on garbage sites or by the side of the road to starve to death. Hakol Chai's recommendations included a ban on horse-drawn carts in the city, permits to keep these animals anywhere to be granted only after annual licensing and inspections by equine veterinarians, and establishing places where abused horses can be taken temporarily for rehabilitation, after they are seized. Outside the meeting, at the entrance to City Hall, Hakol Chai activists demonstrated in support of banning horse-drawn vehicles. 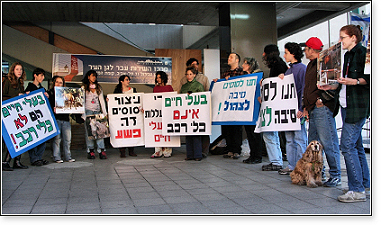 Other organizations joined Hakol Chai's campaign, including the Green Party, and the city also received numerous complaints by tourists. Inside the meeting, attended by many owners of cart horses, Council head and Mayor Ron Huldai said he will first make efforts to enforce an existing regulation that requires horse owners to obtain a permit, conditional upon their providing proper food, maintenance, and veterinary care, before considering a ban on these vehicles, despite the fact that municipal veterinarian Zvi Galin made clear that the city does not have the resources to investigate cruelty cases and seize horses who are abused. The forum was a first step that puts the city on record as promising to bring about change, but clearly, we must keep up the pressure for a complete ban. CHAI first began urging city officials to take action to prevent horse abuse in the summer of 1999, after rescuing a severely abused horse in Jaffa , the old part of the city. Officials brushed aside our concerns and municipal veterinarian Zvi Galin consistently ignored our calls reporting abuse and refused to take action to help the horses. In 2001, Hakol Chai exposed a major abuser of horses in Jaffa, Nissim, who was starving and selling horses, providing no veterinary care, and shockingly, hacking them apart with an axe in front of each other and selling their meat in the market as beef. When an undercover video of the killings taken by a TV investigative reporter aired on a popular TV channel, Nissim's place was temporarily closed down. He reopened again, and Hakol Chai organized a raid on his place in 2003, which again exposed horrendous cruelty. After that, he was shut down permanently. Still, the city took no action to investigate the condition of other horses in the city and remove those being abused from their abusers. In April 2005, Hakol Chai's attorney submitted its proposal to the Council, asking it to hold a meeting to discuss the problem and its recommendations, but until now, the Council took no action. "In the 21st century, there is no place for horses and donkeys in city traffic," Hakol Chai representative Omer Ginzburg told reporters. "Many cities worldwide have already prohibited using horses and donkeys within their boundaries, among them Las Vegas, London, Paris, Beijing, and Toronto. A New York City Mayoral candidate expressed his support for a similar prohibition in his city. On the eve of Tel Aviv's 100th anniversary, it is time Israel followed the lead of these more humane cities." 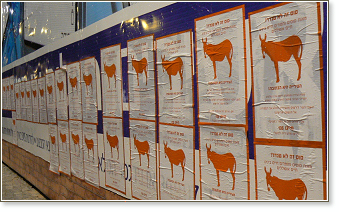 In 2007, Hakol Chai mounted posters throughout Tel Aviv/Jaffa. The posters say: "A horse is not a truck! Hundreds of miserable horses and donkeys live around us. Tel Aviv City Hall is the address! City supervisors can write tickets to cart drivers, the city vet can confiscate the animals. The people of Tel Aviv demand that City Hall fulfill its duties. Don't be indifferent! If you see a horse or donkey in distress, dial 106 and demand that the city act!" See also Hakol Chai's campaign against the introduction of gambling on horse racing into Israel.